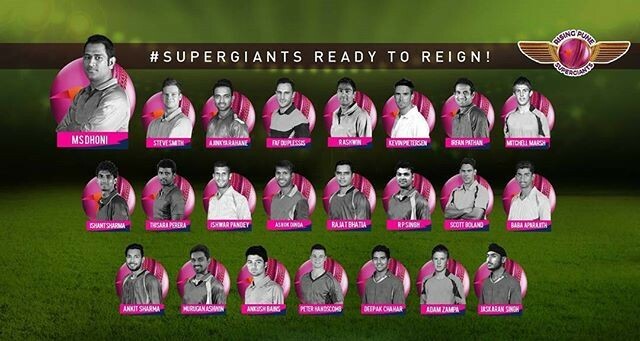 Rising Pune Supergiants one of new team of ipl 9 with Gujarat Lions.Indian captain ms dhoni lead lead rising pune in 9th season of ipl 2016.chennai super kings and rajasthan royals suspended for fixing by their owner/franchise.Ms dhoni is hard hitter no doubt but surly he mis his team-mate suresh raina,ravindra jadeja ,Brendon McCullum,Dwayne Bravo who play for Gujarat lions in 2016 ipl 9.Ajinkya rahane supposed to be approached for role of opener slong with Kevin Pietersen,Steven Smith,Faf du Plessis.its msd and team management decision who will open but we expecting these combination in this ipl for rising pune.African skipper Faf du Plessis give boost to miiddle order with ms dhoni and smith.its tough for dhoni to choose a balanced combination of batting and bowling with all-rounder role like Thisara Perera can contribute by bat and ball as well.In spin attack ashwin lead rising pune in ipl 10 followed by irfan pathan and ishwar pandey pace attack. 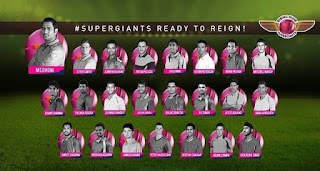 Mahendra Singh Dhoni, Ajinkya Rahane, Ravichandran Ashwin, Ishant Sharma, Ashok Dinda, Steven Smith, Kevin Pietersen, Faf du Plessis, R.P. Singh, Baba Aparajith, Thisara Perera, Peter Handscomb, Ankit Sharma, Jaskaran Singh, Rajat Bhatia, Irfan Pathan, Scott Boland, Mitchell Marsh, Ishwar Pandey, Adam Zampa, Deepak Chahar, Ankush Bains, Murugan Ashwin.